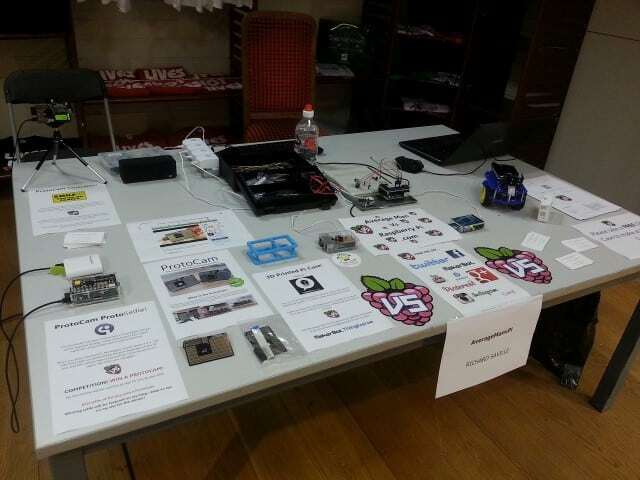 Ok there’s not a lot of famous facts about Croydon, but today we started a new one…today was the London Borough’s first ever Raspberry Jam! 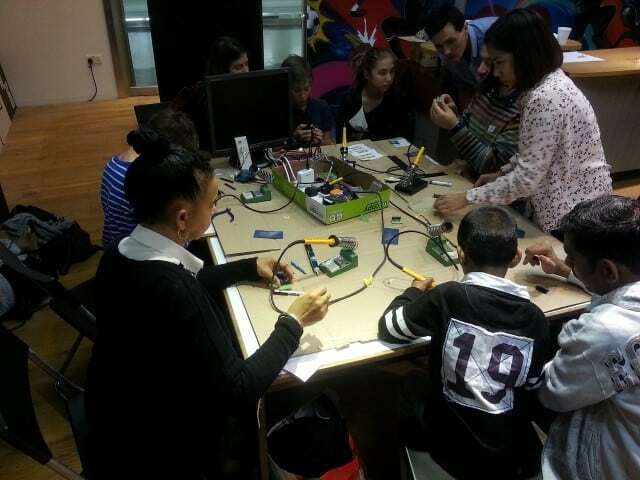 Hosted at the snazzy ‘Lives Not Knives‘ (LNK) unit in Croydon’s Centrale Shopping Centre, the event brought together the usual mix of enthusiasts, newbies, teachers, children and more. 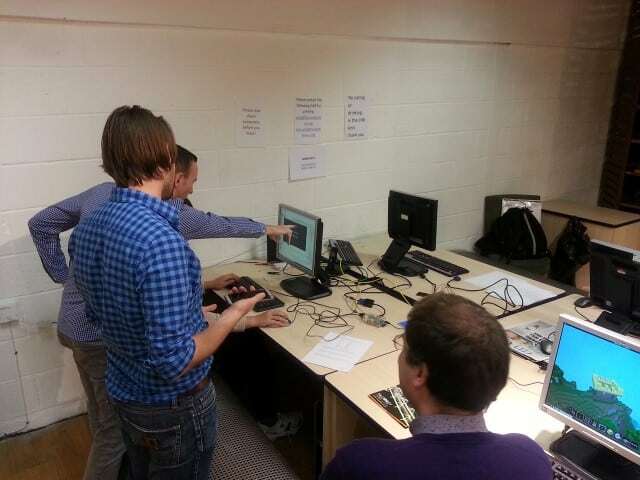 As always with Raspberry Jams, many projects were on show with lots to get involved in. 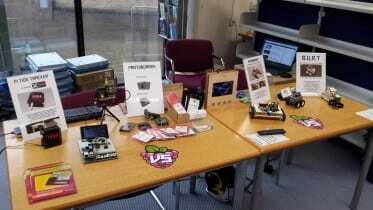 After successfully avoiding a dirty McDonalds breakfast, I navigated the unusually quiet M25 on my way to Croydon’s debut Raspberry Jam. I was greeted in the car park by organiser Jarle Teigland who generously enlisted his son to help carry some of my bit and bobs to the venue. As we entered the LNK unit, I was amazed at the size and spec of the venue for the Raspberry Jam – a huge modern retail unit with an abundance of tables, chairs and ‘Lives Not Knives’ clobber – Jarle did a great job negotiating this place with mega-friendly LNK team. I quickly set up my table with various show & tell pieces including a couple of working examples of my new Kickstarter ProtoCam board. As the venue filled up with both stalls and spectators, I did a lap of the hall to see what else was going on. 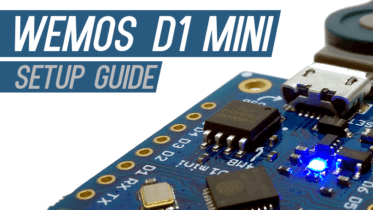 I recognised a few people/projects from across the room, but I love to meet and speak to new folks in the Pi scene. 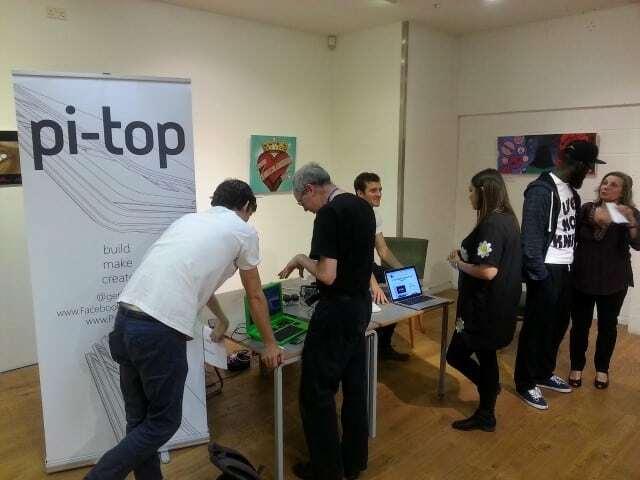 Directly opposite me was the Pi-top team – a recent crowdfunding mega-success with their Raspberry Pi Laptop. 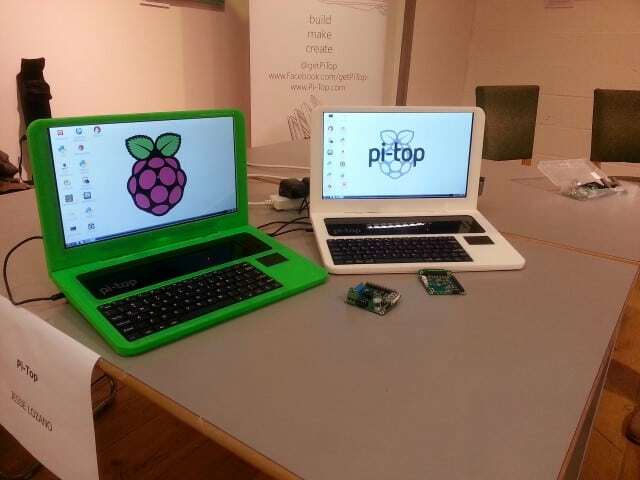 I’d already had a few email exchanges with Jesse as we both use the same 3D printing cafe, so it was good to meet the guys in the flesh – and see the epic Pi-top in person. 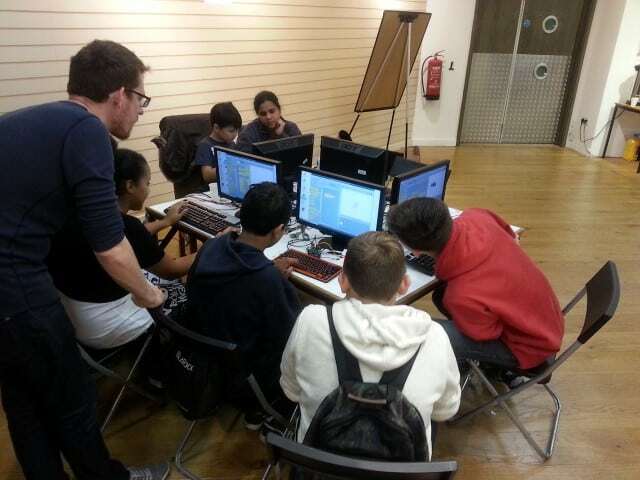 Across from the PiTop guys were a few ‘learning stations’ – a cluster of people learning the popular Minecraft game, a soldering station, and a busy bank of PCs running Scratch. It was great to see these areas constantly busy with young people learning and sharing. 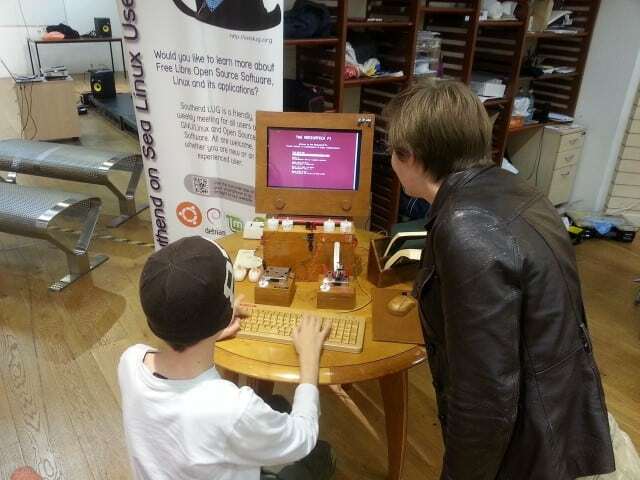 LH Trevail came along with “The Pinnochion” – A Raspberry Pi powered ‘machine’ that takes your questions and responds with a text answer every time. There’s a lot more to this though, aimed more as a social computing project/study than a simple text reply device. I saw the printed version of the Python code for this (in the pic) and it was thicker than most of the books I’ve read – epic! Definitely worth checking out if you can. Fellow Southend’er Derek Shaw from the Southend Linux User Group provided the background music for the day, showing and teaching lots of people the Sonic Pi programming environment on his Linux laptop – a very popular stall. I must admit to not having tried Sonic Pi before, but after hearing the amazing sounds coming out of Derek’s speakers, I’m definitely giving it a go soon. 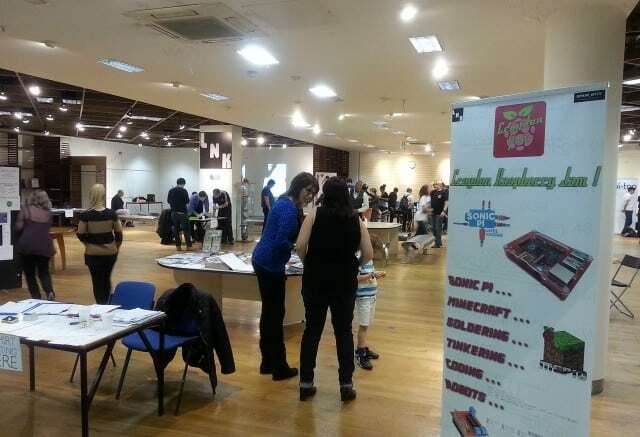 Whilst this wasn’t the busiest Raspberry Jam I’ve been to, for a debut event it really was a great day. The venue was one of the best Raspberry Jam locations I’ve seen, and Jarle did a great job of organising and keeping the day on track. 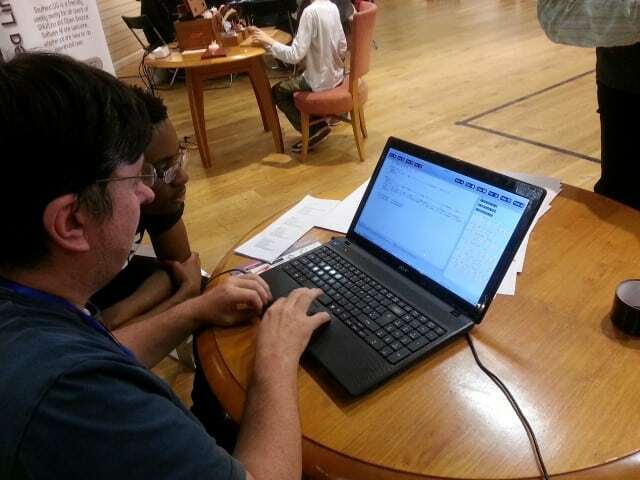 I had lots of great conversations with parents, children, teachers and fellow Pi people – and even got a lesson on shift registers from David Whale. 2 Comments on "The Croydon Raspberry Jam"
Hi Emlyn. I would recommend following @JarJarGeek on Twitter (who organised the event) or keeping an eye on the Lives Not Knives site (where it was hosted) – http://livesnotknives.org/.